Today marks another huge milestone for Diggerland, with an agreement to open a 5th UK park in the picturesque vale of Evesham, Worcestershire. Over the past fifteen years, Diggerland has grown considerably from their Head Office base in Kent. The brand began in 2000 with the very first Diggerland opening on The Medway City Estate in Strood, Kent. In 2003 it was forced, due to escalating demand, to move to a much larger site a few miles away. The success of the Kent park lead to customer comments from all over the country flooding in, asking for more parks in other locations. CEO Hugh Edeleanu, made the decision to further expand. Diggerland is currently operating four UK parks located in Devon, Durham, Kent and Yorkshire. In June 2014, a new franchised Diggerland opened in West Berlin, New Jersey, marking the beginning of Diggerland USA. The new Diggerland park in Worcestershire will open on a multi-million pound redevelopment at Evesham Country Park, which will soon be re-named as “The Valley”. The site overlooks the River Avon and is set in 125 acres of beautiful countryside. It comprises a purpose built garden centre, factory outlet units, a farm shop, as well as its own miniature steam railway. The Valley will offer a shopping village with new retailers, cafes and restaurants, cycle tracks, climbing walls, running tracks, picnic areas and now Diggerland coming in February 2016. Masterhitch Europe Limited, sister company to Diggerland will soon be buzzing with activity behind the scenes manufacturing and engineering the new construction attractions for the Midlands park. The rides will include the well liked attractions of “Spindizzy”, “Groundshuttle” and “Skyshuttle”, as well as many other unique and wonderful construction based machines for children and adults to ride, drive and operate. Masterhitch Europe Limited has proven themselves leaders in the design and manufacturing of large excavator attachments and parts for construction, earth moving and demolition equipment, and have been fabricating the Diggerland rides for over 15 years. 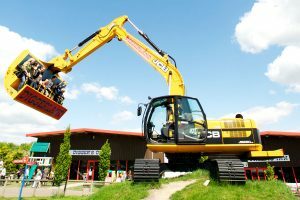 Each of the Diggerland UK locations has opened for the season and feature over 100 diggers, dumpers and other mechanical attractions available for family amusement. For the ultimate adrenaline rush, take a ride on “Spindizzy,” whirl around in the “Dig-a-Round,” test your driving skills on the Dumper Trucks, or get behind the wheel of an eight and half-tonne JCB.